It is well established that countermove jump height (CMJ) is a good predictor of sprinting speed. This is not surprising because CMJ performance depends on powerful type 2 muscle fibres and on the ability to coordinate the recruitment of these fibres. In the CMJ, flexion of the hips and knees produces eccentric contraction of the corresponding extensors immediately prior to the explosive concentric contraction that propels the body upwards. It is necessary to recruit the muscle fibres in a manner that harnesses the enhancement of power generated by the eccentric contraction. The relationship between CMJ performance and distance running performance has been less thoroughly investigated. In assessing endurance training, aerobic capacity and lactate threshold have been the main foci of attention, but other training-related variables also predict performance. It is has been demonstrated that difference between elite athletes in volume of zone 1 training (comfortably below LT) predicts distance race performance (e.g. 10Km). In addition, it is fairly well established that a high values of the ‘stress hormone’ cortisol sustained across a period of months predicts poorer performance. However, somewhat paradoxically, within an individual athlete, week to week variations in training volume and cortisol values make the opposite predictions. In a study comparing seasons best and seasons worst performance in elite athletes, total training volume was less but volume of zone 3 training (appreciably above LT) was greater in the week before the seasons best performance. Cortisol tended to be higher a week before the best performance, Countermove jump height was also higher in the week before the best performance. This apparent paradox is consistent with the evidence that a taper should involve decrease volume but not a decrease in training intensity. The fact that CMJ was higher before the season’s best performance suggest to me that zone 3 training in the week preceding the event promotes good neuromuscular coordination. The importance of neuromuscular coordination is clearly illustrated by the clunkiness that triathletes experience during the bike to run transition. The rapid gains in weight lifting performance at the beginning of a lifting program are most likely due to improved recruitment of muscle fibres. Conversely, fatigue impairs neuromuscular coordination, and measurement of postural sway has been proposed as a sensitive measure of impaired neuromuscular coordination arising from fatigue in footballers. Overall, the evidence indicates that neuromuscular coordination is crucial for both athletic performance and injury minimization but it is rarely the focus of attention in endurance training. While not a specific focus of attention, when we engage in routine warm up we do in fact achieve short-term enhancement of neuromuscular coordination, and when we accumulate miles of training, we engage in long-term enhancement of neuromuscular coordination, but we rarely think of these activities as exercises in enhancing neuromuscular coordination. However, we are more likely to produce effective enhancement of neuromuscular coordination if we plan our warm-up and training activities bearing neuromuscular coordination in mind. Recruitment of muscles in the optimal sequence: The action of running entails a very complex combination of muscle contractions, requiring that the extensors and flexors at each of the major joints of the leg are recruited in a precisely timed sequence. Speed of recruitment of muscle fibres: With increasing age, deterioration in running speed is associated with loss of stride length; not cadence. This is accompanied by a atrophy of muscles and loss of strength. However as I found three years ago when engaged in intense high-load weight lifting program for several months, I was able to increase my strength to the point where I could squat a heavier load than Mo Farah, but my stride length did not increase appreciably, and my speed remained but a very pale shadow of Mo’s speed. Speed depends on power: the ability to exert force rapidly. This requires effective, rapid recruitment of muscle fibres. It is far harder to train power than speed, though there is some evidence that focussing on a rapid contraction during the concentric phase of a lift, at moderate load, can produce a worthwhile gain in power. Implications for warming up For most of my training sessions, I employ a warm up procedure that includes 10 activities, beginning with simple movements designed to get all of the major joints of the leg moving freely, and proceeds though a sequence in which power output gradually increases. Time for each is adjusted according to how my body is reacting, though typically each of the first 8 activities takes 20-60 seconds; the focus is on fluent action rather than effort. Implications for injury minimization Recent studies, reviewed by Herman and colleagues, reveal that in a variety of different sports, poor neurocognitive performance, either at baseline or in the aftermath of a concussion, is associated with elevated risk of musculoskeletal injury. It is probable that a thorough warm-up that sharpens up neuromuscular coordination is a good way to minimise risk of injury. Measuring neuromuscular coordination The CMJ is widely used in various sports, especially team games such as football, to assess fitness. However, it has three potential disadvantages as a measure of neuromuscular coordination for the distance runner: 1) it is not a ‘pure’ measure as performance depends on type 2 fibre strength in addition to coordination; 2) maximal performance is quite demanding and creates the risk of injury; 3) accurate measurement requires special equipment. I have been experimenting with time taken to perform 20 line jumps as a test of coordination. It does depend on other aspects of fitness such as muscle strength to at least a small extent, but placing the emphasis on time rather than maximal power focuses attention on coordination rather than strength. The risk of injury is small. At this stage, the utility of timed line-jump performance as a test remains speculative as I have not tested it systematically. Typically, I find that my time for 20 line jumps decreases from 9.0 seconds after a few minutes of jogging to 7.5 seconds after the ‘neuromuscular’ warm up described above. Time for 20 jumps increases dramatically after a long run. Provided I can establish that the test yields consistent results when assessing deterioration in neuromuscular coordination associated with fatigue, I plan to use it to determine whether or not light weight shoes (Nike Free 3.0) result in greater deterioration in coordination during a long run, compared with more heavily padded shoes. Conclusion It is almost certainly true that many of the activities that athletes and coaches have traditionally incorporated into warm-up and training achieve their benefit at least partly through enhancing neuromuscular coordination. However by focussing on the more easily quantifiable physiological variables when planning and assessing training sessions, there is a risk that endurance athletes might fail to optimise training to achieve the required combination of aerobic capacity, strength and coordination. Perhaps we should place more emphasis on a systematic approach to enhancing neuromuscular coordination during training, and on measuring it to assess the outcome of that training. The gains from training effort vary greatly both within and between individuals. Genes and life-time training history play a large part in determining differences between individuals in response to training. However, genes cannot feasibly be altered and life-time history takes a life-time to create. But there are also factors that we can control in the present that have the potential to influence how much benefit we get from training. Perhaps the most important controllable factor is the balance between stress and recovery. Training creates stress – there is microscopic damage to muscle fibres and an increase in catabolic hormones that break down the tissues of the body. During recovery, local repair processes such as the engagement of satellite cells in muscle aided by systemic anabolic hormones such a growth hormone and vascular endothelial growth factor which promote the development of new capillaries, and the synthesis of mitochondrial enzymes, make the body stronger and fitter. However, if the training stress was too large or too sustained, the body fails to adapt and might even suffer irreversible degradation – the over-training syndrome. Because the ways in which the body adapts to stress are complex there is no single physiological measurement that allows us to monitor stress and recovery. However one of the most reliable measures is the balance between the two divisions of the autonomic nervous system: the sympathetic system that employs adrenaline as the signalling molecule to mobilise the body in response to stress; and the parasympathetic system that employs the signalling molecule acetylcholine to mediate recovery. Because increase in sympathetic activity increases heart rate while increase in parasympathetic activity increases beat-to-beat variability in heart rate (high frequency HRV) we can monitor the balance between stress and recovery by measuring heart rate and/or high frequency HRV. However, there are three major complications that make this tricky. First of all, the balance between the sympathetic and parasympathetic systems is affected many transient circumstances, such as the occurrence of loud noise or time of day, that have only minor relevance to the balance between stress and recovery on the time scale relevant to repairing the body. Secondly, the way in which the autonomic system is regulated is not simple. Although initially stress causes an increase in sympathetic activity, it the stress is too great or too sustained, the body reacts by a compensatory increase in parasympathetic activity – the rabbit in the headlights situation. Thirdly, as we get fitter, the amount of parasympathetic activity in any standardised restful situation increases, while the amount of sympathetic activation required to generate a particular power output decreases. This third factor provides additional useful information: increased high frequency HRV at rest or decreased HR at a given level of power output provides a useful measure of increased fitness, but there is a catch. Changing fitness level produces a shifting baseline if we wish to use sympathetic/parasympathetic balance to assess the current balance between rest and recovery, while transient stress such as sleep disturbance, can interfere with the use of either resting HRV or HR in response to load as a measure of fitness. One way of dealing with these problems is to perform regular measurements, perhaps daily, under very carefully standardised conditions – such as immediately after getting up in the morning in a quiet setting while breathing at a predetermined rate – as recommended for HRV measurements using the Ithlete, developed by Simon Wegerif. I have followed this procedure over a period of many months, using my Polar RS800CX to provide the required information about beat to beat variation in heart rate, rather than the Ithlete. However, at least with my varying daily schedule and sleep patterns, apparently random fluctuations tend to overwhelm the systematic changes of interest. Furthermore, I found it difficult to distinguish the increases in HRV that denote healthy recovery from those heralding the onset of over-training. While I cannot rule out the possibility that Simon’s Ithlete algorithm is more successful than my own interpretation of the data, the inconsistency of some of the variation in HRV led me to conclude that additional data acquire under a range of circumstances might be more informative. As you get fitter HR at a given power output falls. There is a fall in HR relative to maximum heart rate, due to increased efficiency of the delivery of oxygen to muscles, but also an appreciable fall in maximum heart rate. Maximum heart rate is usually identified as the rate beyond which there is no further increase despite increasing work load when power output is increased in a graded manner. Interestingly, it is sometimes possible to achieving a rate greater than this maximum by an initial brief, intense burst of activity at a power output exceeding that required for peak HR (as in a Wingate test), and then allowing power output to decrease gradually. This suggests that maximum heart rate is not fixed but is set by a ‘central governor’. I do not think that the ability to trick the governor into allowing a higher HR is a useful procedure, but the realisation that HR at high power output might be regulated by a governor led me to reconsider an observation that I reported in my post of 12th September 2009 and have repeated on several occasions since: namely that following a period of excessive training, a major subjective effort required to push HR even to the level of the second ventilatory threshold (beyond which acidity accumulates very rapidly creating a very powerful respiratory drive). In that post of 12th September 2009 I had described the experience of overwhelming subjective difficulty in maintaining a high power output on the elliptical cross trainer despite a lower heart rate than usual at that power output, at a time when I was suffering from over-training, following over-enthusiastic recommencement of training after illness. It felt as if a powerful restraining influence was preventing my heart from beating too hard. This suggested that the most sensitive way to assess impending over-training might include not only resting measurements of HR and HRV but also measurements across a range of work-loads spanning the full aerobic range. Although in principle, such measurement might be performed either running or on the elliptical cross trainer, on account of the fact that I am limited mainly to training on the elliptical when my arthritis is troublesome, I initially developed a protocol for the elliptical cross trainer. I have subsequently developed a version of the test for use to measure HR when running at various paces. The running version works similarly, but because I have acquired data on the elliptical at the beginning and end of my recent period of base-building, I present the elliptical version in this post and will describe the running version in my next post. 1) It should proved a comprehensive set of measures of autonomic function across a range of work-loads from rest to near the second ventilatory threshold (identifiable in practice by the need to increase respiratory rate to around 80/minute, and corresponding approximately to the anaerobic threshold). 2) It should be feasible to include it within a normal warm up, requiring less than a total of 20 minutes and demanding only a short period of high effort. 3) The key measurements should be based on heart rate, though during development of the test I used Polar RS800CX to record the R-R interval between consecutive heart beats, thereby allowing comparison of the predictions based on HR with those based on HRV. I modelled the major features on the protocol on the sub-maximal cycling test developed by Lamberts and Lambert, in which heart rate is measured at three different work-loads. The key component of the test is an assessment of heart rate at three work-loads spanning the aerobic range: a load in the lower part of the aerobic zone, with heart rate around 60% of maximum heart rate; a medium load with heart rate around 75% of maximum, and a high load with heart rate around 85-90% of maximum. The low and medium loads are maintained for 4 minutes each, during which time heart rate reaches a stable plateau, while the high load is maintained for only three minutes. At the high load, the HR does not reach a plateau. Achieving a plateau at this work-load takes about 10-15 minutes and would make the test unnecessarily stressful. The three work-loads were achieved at resistance settings 4, 8 and 12 on the elliptical. I maintained a constant cadence of 80 cycles/min (160 steps per minute) giving a power output of 62, 135 and 199 watts at resistance settings of 4, 8 and 12 respectively. I would anticipate that a younger and stronger person would require higher resistance settings and greater power output to achieve the target heart rates for the three levels. In addition to recording heart rate, I also record the subjective effort level at each of the three levels on a scale from 1 to 20 where 1 is very easy (typical of relaxed walking, 3 is slight effort (eg faster walking or very easy jogging), 8 is comfortable running, while 16 requires determined effort to sustain and 20 is the hardest effort I could imagine. To provide a more comprehensive picture of the autonomic responses the test also includes measurement of resting HR and HRV while standing in a relaxed state for one minute before the start of the test, and measurement of heart rate recovery (HRR) while standing in a relaxed state for one minute at the end of the high load phase. Between the initial minute of relaxed standing I do a very gentle warm-up for 2 minutes, at around 55% HRmax, so as to exclude that the initial period of erratic HR (apparently due to somewhat erratic opening of capillaries) from the low-load test period. After the second period of standing, I do 4 minutes of gentle cool down at the same work load as the initial warm-up to assess the stress accumulated during the test, and to make a transition to subsequent activity. The time course of the HR during the test is shown in figure 1. R4, R8 and R12 denote the three resistance settings required to produce the target heart rate for the three different levels of the test. The red trace is a recording in the week immediately preceding a 10 week block of base-building with an average weekly training volume equivalent to 50 miles of running. The blue trace is a recording at the end of this training block. Comparison of the red and blue traces reveals a similar proportional decrease in HR at each load. This is also shown the bar chart in figure 2. The height of the bars represents the heart rate at each of the stages of the test. There is a reduction in heart rate of approximately 5% at each of the three test loads. This fairly uniform reduction in heart rate across the aerobic range should be compared with the fairly uniform reduction of about 10% in heart beats/Km across the entire aerobic range achieved by Hadd’s protégé Joe following 16 weeks of base-building at a weekly training volume that was mostly above 80 miles per week. Bearing in mind that I am an elderly runner with limited capacity to withstand hard training, I am pleased that I achieved a roughly similar amount of improvement relative to training volume to that achieved by Joe. I will describe this base-building in more detail in a later post. Fig 1: beat by beat records of heart rate during tests on 13th March, in the week before 10 weeks of systematic base-building (red trace) and on 1st June, at the end of this block of base-building (blue trace). R4, R8 and R12 denote the elliptical resistance setting require to achieve the heart rate in the three target ranges. Note the large heart rate variability when standing. The sporadic spikes at around 4 min in the red trace are probably premature atrial contractions. The traces in figure 1 show beat by beat variation, and appear more erratic that the 5 second averages produced by most heart rate monitors. The high variability during relaxed standing at the start indicates large high frequency variability in heart rate, indicative of a high level of parasympathetic activity. Similarly the rapid increase in variability after about 50 seconds of standing during the recovery period activity demonstrates the return of parasympathetic activity. The sporadic sharp spikes at around 4 minutes in the record for 13th March (red trace) are probably premature atrial contractions, which are fairly common in an elderly runner. 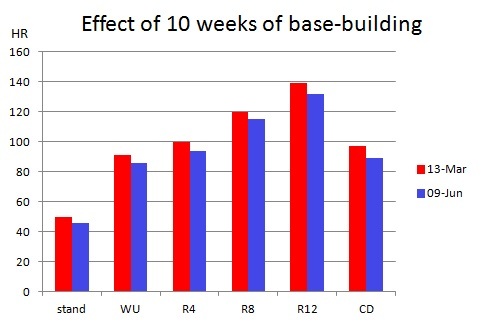 Fig 2: Effects of base-building: bars indicating the near-stable hear rate achieved in each phase of the test, at the beginning (red bars) and end (red bars) of 10 weeks of base-building. WU denotes warm-up; CD denotes cool-down. Due to instability as capillaries open during the first 90 seconds of the warm-up, the value in the final 15 seconds is shown. The other values are the average over the final 1 minute of the relevant phase of the test. At the beginning of the year I had suffered an episode of mild arthritis. As the joint pain began to resolve in late January I was eager to build up the volume of training on the elliptical cross trainer. However, in my eagerness I built up the training volume too rapidly, and at the end of the month, I was becoming exhausted. Figure 3 depicts the heart rate at each test phase during tests performed on 27 and 29th of January and again on 1st Feb. Fig 3: The early signs of over-training. From 27th to 29th January heart rate at each phase of the test dropped rapidly by almost 5% while the subjective effort at the high load level (R12) increased dramatically. The decrease was greatest at R12. After 2 days rest, HR in 1st Feb had returned to levels similar to those recorded on 27th January. The crucial informative feature was my rating of subjective effort at the high load. During all 5 tests in the preceding two weeks in mid-January, I had rated the effort at the high load as 14 on a scale from 1 to 20. On 27th Jan I also assigned a rating of 14 but two days later, on 29th, there was a clearly perceptible change in the effort required. It required a determined effort to complete the three minutes and I rated the effort at 16. This increase in effort was accompanied by a sudden drop on HR of almost 5% at each of the three loads. I recognise that this was the onset of an over-trained state and rested for two days. By 1st February, the heart rate reading were again back to the levels recorded on 26th Jan, and I found it quite easy to complete the three minutes at the high load. I assigned an effort rating of 13. Thus, the comparison of 27th and 29th January reveals a drop in HR very similar in magnitude to that achieved by 10 weeks of systematic base-building a few months later. The crucial factors are that this reduction of almost 5% occurred over a 2 day period and was accompanied by a very easily perceived increase in subjective effort. However the problem resolved rapidly with two days of rest indicating that it was only the early phase of over-training. During the systematic base-building phase starting in March, I built up training load in a well controlled manner and did not experience any dramatic sudden reductions in heart rate at a given load. However other aspects of my life were less easy to control. In mid-May experienced a demanding period at work. On 13th and 15th May I had only a very short night’s sleep. I did continue training according to my plan, but in a sub-maximal test on 16th May, I noted that the HR at the various levels of the test was 3-5% higher than it had been two weeks earlier. It is probably significant that this effect was most noticeable at the low load and also in the standing HR. By the beginning of June, the stressful time at work was behind me and the heart rate at each level was back to the value at the beginning of May (though slightly lower at the R4 and R12 levels, perhaps indicating a small gain in fitness due to training). Thus, the immediate effect of stress was an increase in HR that reached its peak following a night of seriously curtailed sleep, but it is also noteworthy that the gains in fitness over the entire month were only marginal. Fig 4: the effect of a stressful week at work with reduced sleep, in mid-May. HR increased by about 3-5%, with the greatest increases in the standing and low load phases of the test, after a busy day at work and a short night’s sleep preceding the test on 16th May. The overall gain in fitness in May was only marginal, as indicated by the small reductions in HR at R4 and R12 on 1st June relative to 4th May. 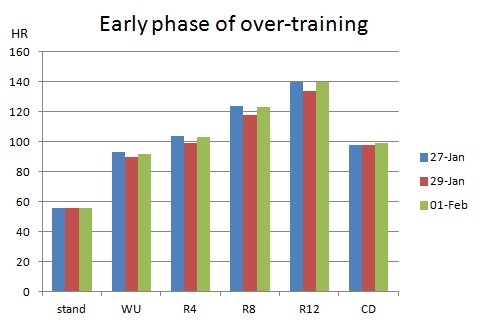 Standing HR shows similar pattern of variation with training (fig 2), over-training (fig 3) and stress (fig 4) as the HR at each of the three test levels. However, in general standing HR is less reliable than during exercise because it is more sensitive to current stress levels. 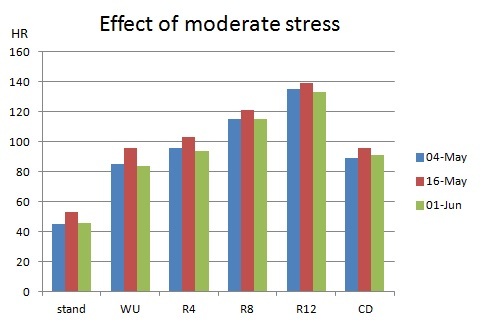 In fact the standing and R4 scores alone can provide a very quick and easy test of current stress level, but detection of the early over-training is more reliable when the full range of scores is obtained. On days when standing HR was low, high frequency HRV was usually high, confirming strong parasympathetic activity and generally denoting good recovery. When standing HR was less than 48 beats/min, the root mean square of deviations (RMSSD) was typically greater than 70 milliseconds, whereas at times of stress, standing HR exceeded 50 beats/min, and RMSSD was usually much lower, sometimes as low as 41-43 milliseconds. The lowest recorded standing HR during base-building was 45 and this was accompanied by an extremely high RMSSD of 163 milliseconds. Thus RMSSD provides a rough guide to the level of recovery, though the extremity of the swings in RMSSD made it an unreliable measure. On 29th Jan, when I was showing signs of over-training RMSSD was 94, a moderately high value indicating substantial parasympathetic activity, but the definitive evidence of over-training was provided by the low HR and high effort at the high load (R12 level). Heart rate recovery (HRR) tended to increase steadily as I became fitter. The drop in HR during 1 minute when standing in a relaxed state immediately after cessation of the high load epoch was typically 50 beats/min in January and February as I began the build up training volume. It had increased to 55 beats/min by the time I commenced regular base-building in mid-March and was in the low 60’s by the completion of the block of base-building in early June. It was atypically low (45 beat/min decrease over 1 min) when I showed sign of over-training on 29th Jan and atypically high (71) when I exhibited signs of stress on 16th May. Thus HRR augments the picture provided by the changes in HR at the high work load (R12) but shows less consistency. While the HR at the three work-loads provides the most reliable information, the picture is consolidated by the overall pattern, including standing HR, HRR and HRV. The use of this sub-maximal test gave me the confidence to build up my training load at a fairly rapid rate, while nonetheless avoiding serious over-training or injury. However it was also noteworthy that the data indicated that I achieved only a small increase in aerobic fitness during the month in which overall stress level was quite high, suggesting that I might have benefitted more if I had taken more rest during that month. Addendum added 28 June 2013. In his comment below, Ewen suggests that large amount of data generated by this test appears a bit over-whelming. He reports that he himself simply measures resting HR. As I noted in my response to him, I consider that resting HR is certainly a worthwhile measure, but the reason I have spent time designing this more complicated test is that I found that a single measures such as resting HR or resting high frequency HRV are too sensitive to various different transient circumstances, making it difficult to interpret the results reliably. To some extent one can deal with this by performing a single measurement such as resting HR or HRV under constant circumstances every day, but with my variable life routine this doesn’t work well enough. So in the test described in this post, I have adopted the approach of performing multiple different measurements within a more complex test. It is still necessary to standardise the circumstances, but the overall picture provided by multiple measurements makes it possible to obtain a more reliable estimate of changes in both fitness and recovery. However, it does produce a bewildering amount of information. While I find this large amount of information quite interesting I accept that it might appear a bit over-whelming. So maybe for routine use, one should focus on one key measurement and only examine the other variables when the key measurement is out of line with expectation. I think that the single most informative measurement is the heart rate at a medium work load. Provided the load is consistent, this measurement is the one that is most consistently related to overall recovery and fitness. If this HR is decreasing slowly over a period of many weeks during a block of training, all is well. If there is a rapid jump upwards from recent values, it probably indicates transient stress. This can be confirmed by noting an increase in standing HR (and perhaps a decrease in HF HRV if you have a monitor that records beat by beat variation). It is no cause for alarm, but it is worth identifying and dealing with the stress. A sudden drop in HR at medium load is the important marker. If this is accompanied by additional effort that is most noticeable at the higher workload, it is probable that you are in the early phase of over-training and need to adjust training accordingly. I am just back from an easy 10K run in the woods and along the river bank. We are now at the mushy end of a thaw that set in two days ago. At the edge of the village, two slumping lumps of snow are all that remain of a snowman and his partner; a sad demise on St Valentine’s day. In the woods a few drifts of mushy snow remain and some mini ice floes float in scattered puddles, but the paths are mainly mud. Staying upright is almost as difficult as it was on the sheets of icy snow last week. Mud does not raise the spirits in the way that snow does. However, the clumps of snow drops in full bloom provide some compensation and the thick green carpet of bluebell shoots indicate that spring is not too far away. The River Trent is in spate, swollen with melt-water but still far from bursting its banks. Nonetheless, the ancient mill race on the escarpment side of the riverside path, but connected to the river by a tunnel, is full of water. On account of the mud it took some time before I developed a good rhythm, but in the final few Km I was running fluently and comfortably at about 5:30 min per Km. In November, at the time when I decided to re-introduce several elliptical cross-training sessions into my weekly schedule, I had developed a simple test of aerobic fitness. I record heart rate in the final 15 sec of a series of consecutive 2 minute intervals. At the beginning of each interval I increase the resistance but maintain a constant cadence so that power output increases in a series of 7 steps spanning the aerobic zone. Before my run today I did this aerobic test as a warm up, and was pleased to find that my heart rate at each level of the test is about 12 BPM lower than it was on November. In part this improvement is due to the fact that my asthma is much better today. There was scarcely a trace of a wheeze. My performance on this test fluctuates day by day depending on how wheezy I am. It is probable that I will not do as well in future on days when the wheezing is worse. However even if I were to take the average the most recent three tests and compare with the average of three tests done in November to smooth out the daily fluctuations, there would still be a definite improvement, perhaps by around 5 BPM at each level. This improvement has occurred over a period of three months during which I have done 2 or 3 easy (or moderate intensity) running sessions and 3 to 5 elliptical sessions per week, apart for a few weeks in which training was curtailed by injury. The majority of the elliptical sessions have been in the upper part of the aerobic zone (30 – 35 sessions over the three months). I have done a total of 5 sessions in which I exceeded lactate threshold, and 4 sessions in the lower or mid aerobic zone. One good thing about elliptical training is that it does not produce any appreciable leg muscle soreness on subsequent days. This is almost certainly because of minimal eccentric contraction. The lack of eccentric contraction during the elliptical sessions will probably have resulted in some de-conditioning of my legs, and it is unlikely that I could run anywhere near my potential best over 10K or a half marathon at present. The interesting question is how much running will be required to re-condition my leg muscles for running. Whatever the answer to that question, it is pleasing to know that I have been able to improve aerobic fitness substantially without stressing my legs. I recently devised a test of cardiac fitness based on the relationship between heart rate and power output on the elliptical cross trainer. At home we have a Tunturi C6 elliptical, which I had bought as a present for my wife almost 4 years ago, at a time when she had expressed an interest in getting fit. After about three sessions on the Tunturi, she took up cycling to work and has continued to do so ever since. So the Tunturi achieved its purpose, but not quite not in the way intended. For the past four years it has mainly stood un-used in the guest bedroom. From time to time I use it myself, though I find it far less interesting than running in the country-side. However, it does come fitted with a power meter and heart monitor so it offers the possibility of a test of fitness that is independent of the weather and the bogginess of the woodland or riverside paths. My recently devised test consists of consecutive 2-minute epochs at 160 steps minute with six step-wise increases in resistance such that power output increases in steps spanning the range 30 watts to 230 watts. I record average heart rate in the final 15 seconds of each 2 minute epoch At my present level of fitness, my heart rate when generating an output of 30 watts is around 90 and rises in a straight line to around 145 at 230 watts. It should be noted that my actual rate of energy consumption is much greater than indicated by the power meter. Comparing the power meter reading with the estimated energy consumption (in Kcals/min) demonstrates that for a 63 Kg person, about 83% of the energy consumed is spent overcoming internal friction in muscles, ligaments and joints, and ends up generating body heat. The rate at which the sweat pours off me confirms that a large proportion of the energy is spent heating the body. The attached chart shows the graph of heart rate v. power output on 17th November (filled diamonds), before I commenced my recent back-to-back moderate intensity training sessions; and two weeks later on 30th November (open diamonds) when my fitness had improved quite noticeably. HR was about 10 bpm lower than on 17th November across the entire aerobic range. I tested myself again today before my run. The open triangles indicate today’s HR readings and demonstrate that my recent bout of flu has taken me back to a level of fitness only marginally better than on 15 November. In this game of snakes and ladders, fitness is gained with great effort and lost very easily. After the fitness test on the elliptical I went for easy 10K run in the woods. The woodland floor is still thickly carpeted in leaves, mainly the rich brown of beech and somewhat more sombre brown of oak, but to my surprise, green shoots that look like sprouting bluebells were pushing their way through the leaf cover. Maybe they were snowdrops, which are more likely in December, but they looked like bluebells – so even though this winter has so far been chillier than recent winters, it appears that global warming is causing confusion among the woodland flowers. I did not have my camera with me, but I have pasted a photo which I took at the beginning of May 2008, in the header of my blog. Maybe in 2009 we will have scenes like this before mid-April. I have now done three runs since settling on the style described in my blog on Mechanics of Efficient Running posted yesterday, and I have been practising the swing drill daily since I developed it 4 days ago (amidst the ennui of Boxing Day). For each of the three runs since Christmas, I have had a very strong subjective feeling that I am running in a more relaxed manner than previously. Furthermore, I have been free of significant musculoskeletal aches and pains. Today’s run was a 15 Km run at 4/10 effort over a path that is fairly flat apart from 5 short, sharp hills. For many months I have been using this run to gauge my fitness. So, although it is far too early to draw any firm conclusions about improvement in efficiency, I thought it would be interesting to compare today’s run with my two most recent runs over the same course under comparable conditions. Those two were on 25th November and 2nd December. After a relatively substantial amount of training in the summer, when I ran an average of 50Km per week over a period of three months, I have decreased my running since mid-September to around 25Km per week. Therefore, I suspect that I have not increased my cardio-respiratory fitness since September. This is confirmed by my resting heart rate with reached an ‘all-time’ low of 44 beats/min in the summer, rose to 48 by the end of November and is now 51. Therefore, my subjective experience that I am running faster for a given degree of effort since adopting my new style is unlikely to be due to increased cardio-respiratory fitness. With this in mind, I was interested to look at the performance data for today’s run compared with the comparable runs at end of November and early December. On 25th November my time for 15Km was 82 minutes and mean heart rate was 131. On 2nd December, the time was again 82 minutes and mean heart rate was 129. Today, my time was 79 minutes and mean heart rate was 130. The very similar mean heart rate recordings confirm that I had adjusted the effort to approximately the same level on all three occasions. However my time today was almost 4% faster than on the other two occasions, and was in fact the fastest I have ever recorded over this course. So my subjective experience that I am running faster at the same effort was confirmed by the data from heart rate monitor and stop watch, though a 4% improvement on a single run is unlikely to be statistically significant. This evidence is at best anecdotal. The other important issue is musculo-skeletal stress. For the past year I have recorded musculo-skeletal aches and pains in the morning and evening every day. I rate the aches and pains on a numerical scale which I devised myself. This scale places emphasis on pre-existing problems with my right knee and also with metatarsalgia (pain in the right forefoot). My average evening score throughout the year on this numerical scale is 2.5. The score is usually a little higher after a long training run. My peak evening score so far, recorded on three separate occasions during the summer, is 6. On both 25th November and 2nd December, after the 15 Km run, the evening score was 4. Today it is 2, with contributions from very mild metatarsalgia and mild generalised muscular ache. My knee is fine, and I have no focal muscular pain. So the evidence suggests that my new running style does not exacerbate my musculoskeletal problems. So far, so good! It would be foolish to draw too many conclusions from a single training run, but these observations do at least suggest that my new style has not caused any deterioration in my running efficiency. The important question is what will I be able to report after several months. You are currently browsing the archives for the efficiency assessments category.